What are the options for DIY Solar Power? So, you’ve seen the figures on solar power and you want a piece of the action. But the price of commercial installations is shocking! With even the big installers stating that their systems will take years to pay for themselves, your dream of installing 5kW of panels and selling your surplus back to the local power company may remain a fantasy. So what is a do-it-yourselfer to do? Well, how about starting small? Absolute minimum is a pocket charger for your phone or iPod. These are handy gadgets and they help you ‘think solar’. Next step up is a self-contained solar yard light. You can set it to store energy during the day and light up the path when you get home after dark. SolarSetPoint.com makes some nice ones. Not ambitious enough? 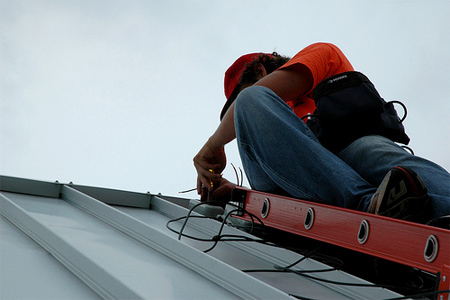 If you’ve got a shed or cabin in the garden, why not put a panel or two on the roof? 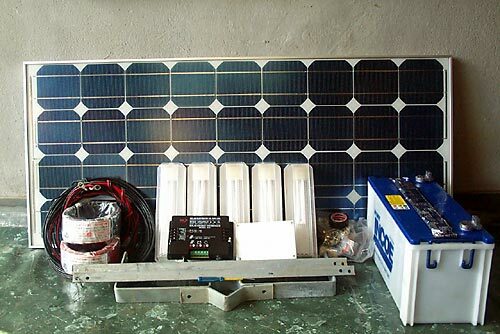 With a few simple components, you can go ‘off the grid’ in your own solar-powered workroom. More? Instructables.com has a ton of neat solar projects. If you have cash to spare, a bigger budget buys a more elaborate kit and more gadgets. The neatest we’ve seen is Sundaya’s Ulitium system, which includes lighting, appliances and even an LCD television. Each item has its own inbuilt batteries and power management — just wire them to a panel and you’re good to go. But even expensive DC systems like this are standalone. You’ll need yet more gizmos if you want to wire your solar panels up to your AC appliances — and maybe the grid.